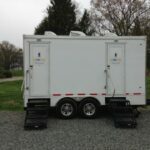 When it comes to events with portable toilet rental Maine calls VIP To Go, the single largest provider of restroom and shower trailers to the Pine Tree State. In fact, we are not sure there are any other companies who actually keep a supply of trailers in Maine and have staff located directly in this beautiful moose laden state. But VIP To Go is here, in your own backyard, ready to serve from Portland to Bangor, Jackman to Fort Fairfield. 1. VIP To Go knows the area. In Maine portable toilet rentals are often an important part of a variety of events, all year long. From summer beach festivals along the gulf coast to winter skiing competitions and events, VIP To Go knows how to move our trailers through this historic yet modern state. 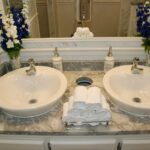 We can provide luxury Restroom Trailer rentals in Maine to help ski lodges and other events beat the winter cold, as we did during the record breaking cold and snow of 2013-2014. And we have technical support located nearby to handle any issues that the extreme weather can bring. 2. At VIP To Go we understand the unique mountains and sand of Maine. 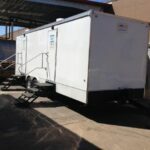 VIP To Go has experience moving our trailers through the hills at the base of the mountains and getting our restroom trailers where they are needed when they are needed. We also have the right equipment. 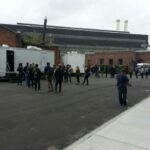 In fact, one time we had to rescue another restroom trailer company who was delivering from out of state and, without understanding how unique the geography of Maine is and lacking the proper equipment, they got stuck on a hilly trail leading to an event. VIP To Go workers used our advanced equipment to get them unstuck fast. 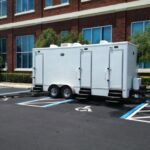 When it comes to portable toilet rental Maine chooses VIP To Go! 3. We have local employees right in Maine and storage yards in nearby New Hampshire. 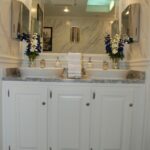 In addition to excellent customer service and the ability to do the job right, when it comes to portable toilets Maine deserves selection, and that’s just what you get with VIP To Go. 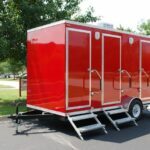 We maintain a huge portion of our 150 plus restroom trailer fleet in New England. In fact, a large selection of trailers sits just to the south in New Hampshire, waiting to be delivered to any Maine event. When it comes to portable toilet rentals in Maine, VIP To Go is the premiere supplier, with the selection, experience, workforce and customer service to make your event, big or small, one to remember. When they need a portable mobile toilet Maine calls VIP To Go and you should too! Call us today to reserve a luxury trailer for a wedding, a bank of trailers for your beach festival, a fireplace trailer for your ski lodge and anything in between. 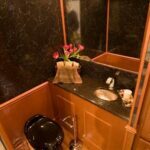 Renting a portable restroom may seem daunting at first, but once you understand the benefits and choose the right company it’s easy sailing. Whether you need a fancy porta potty rental for a wedding or a variety of simple units for disaster planning, VIP To Go has a pricing plan for you.